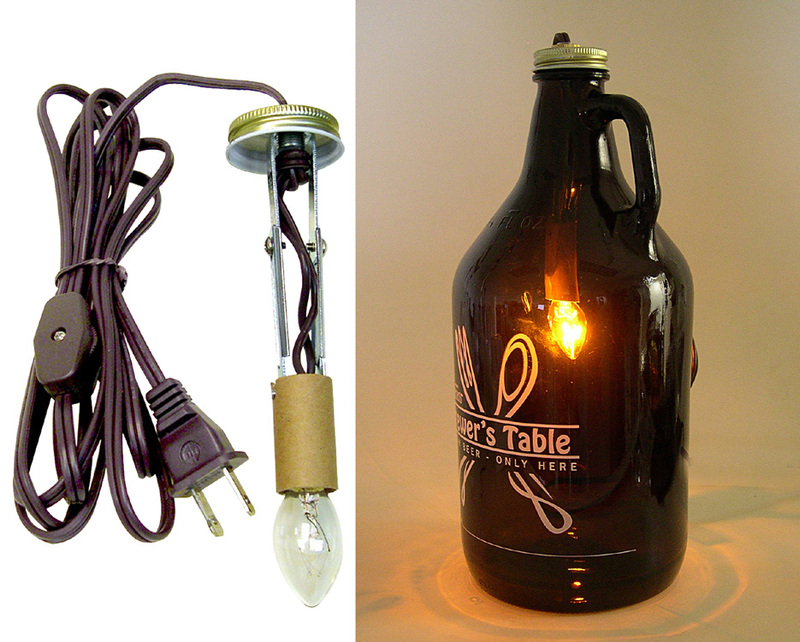 Beer Growler Lamp Making Kits convert your Growler into a novel Table Lamp or Night Light quickly and easily. Pre-Wired and kits include standard size 38mm pre-drilled metal Growler Cap. GROWLER BOTTLES ARE NOT INCLUDED IN KITS. KIT A, B and D are Pre-Wired and Assembled and have power cord that exits from side of socket - so you don�t need to drill a wire-way in your container. Kits C & D include fully illustrated easy to follow assembly instructions. Kit A, B & D have Edison Style Medium Base Socket with Push-Thru On/Off Switch. NOTE: Growler Bottles NOT Included. A) Beer Growler LAMP KIT with Glossy Black 38mm metal cap. Has 8 ft. clear gold cord with 2-prong polarized plug, push-through on/off switch and gold finish metal Edison base socket. Bulb NOT included. 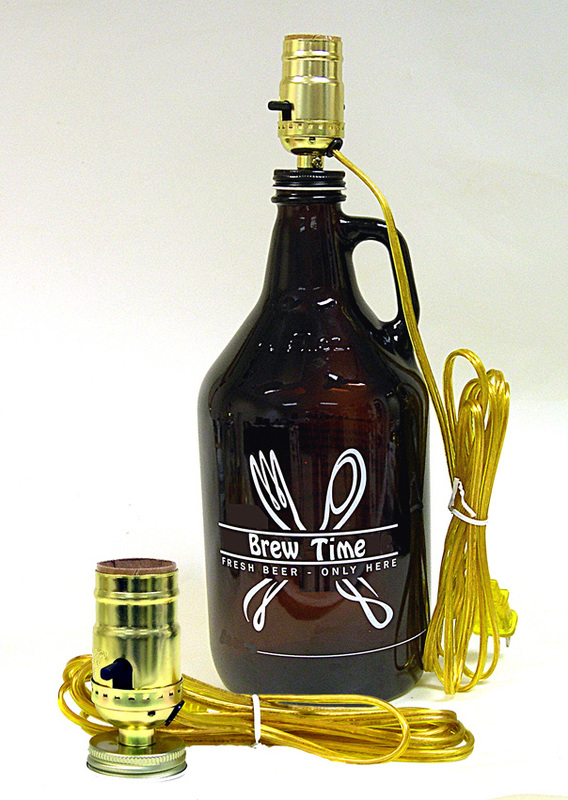 B) Beer Growler LAMP KIT with Satin Gold 38mm metal cap. Has 8 ft. clear gold cord with 2-prong polarized plug, push-through on/off switch and gold finish metal Edison base socket. Bulb NOT included. C) Beer Growler NIGHT LIGHT KIT with 38mm Satin Gold Metal Cap. Has 8 ft. brown cord with 2-prong polarized plug, in-line on/off switch, adjustable candelabra socket and 4 watt clear light bulb. REQUIRES ASSEMBLY. D) Beer Growler LAMP KIT with 60W Antique Style Edison Bulb. Also includes Gold 38mm metal Cap, brass Neck, 6 ft. Brown Cord with 2-prong polarized plug and gold finish metal Edison base socket with push-through on/off switch. EASILY ASSEMBLED. A) Beer Growler Lamp Kit with Glossy Black 38mm metal cap. 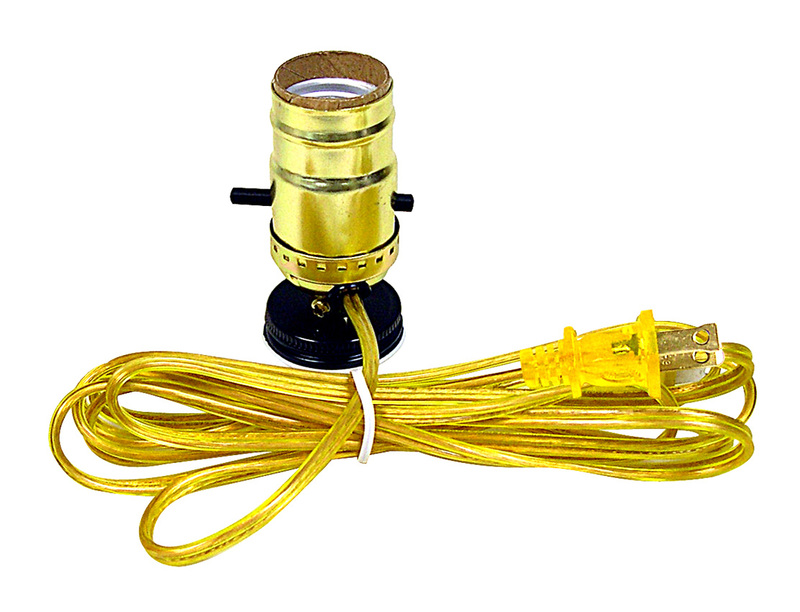 Has 8 ft. transparent gold cord with 2-prong polarized plug, push-through on/off switch, gold finish metal Edison base socket. Bulb NOT included. B) Beer Growler Lamp Kit with Satin Gold 38mm metal cap. 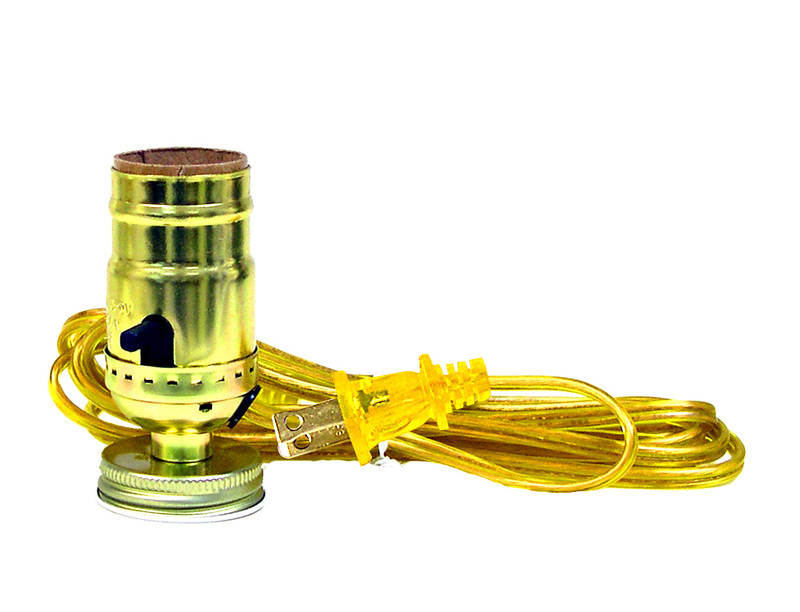 Has 8 ft. transparent gold cord with 2-prong polarized plug, push-through on/off switch, gold finish metal Edison base socket. Bulb NOT included. C) Beer Growler Night Light Kit with 38mm Satin Gold Metal Cap. Has 8 ft. brown cord with 2-prong polarized plug, in-line on/off switch, adjustable candelabra socket and 4 watt clear light bulb.